We have seen in the hands of the pros what the D413 from HB is capable of, now it is time to see how it stacks up for us mere mortals. So far they seem to be fairly psitive about the kit with a couple of disliked items, but they are holding back on judgement to see if they work. We will make sure we bring you further parts of this review, so keep an eye open. Report by Aaron and Mark Stringer. Around 100 drivers attended the Queensland State Titles held at the Logan off Road Club in Brisbane. Aaron was entered in Buggy and Truggy. This was the same club/track that hosted the Australian National Titles for 2014, so we were expecting a good showing. Due to work commitments we didn’t get down till late Friday afternoon which meant we missed all of practice, the first round of qualifying and the 2nd round qualifier for Truggy by 10mins due to traffic issues. We did make it for the 2nd round of Buggy qualifying, Aaron hit the new track and laid down a great run to finished 2nd for the round. So in the end we drove 3 hours for 7 mins of racing but was a good 7 mins!!!. We arrived bright and early Saturday morning for another 3 rounds of qualifying. We needed all of these in Truggy as we did not get a run in on Friday. First was Truggy which Aaron drove perfectly to TQ. Next was Buggy and another 2nd for the round overall had us looking good. Round 4 and Aaron once again scored a TQ in Truggy another second in Buggy for the round. Things were looking good for the Buggy with 3 2nd places assuring us a spot in the A-Main. We just needed one more decent run in the Truggy and we would secure TQ and a good starting spot in teh A-Main. Unfortunately we had DNF due to a mechanical failure. This saw us drop to 8th for the A-Main,right in the middle of the 15 car field and where all the carnage happens. The last run in Buggy was epic as we missed TQ by 2 of a second!!!! The cars looked dialled for the 10 min practice session prior to the A-Mains. Truggy was up first and Aaron got a great start and was in 2nd place by the 2nd lap. After a good Tussle with S-Workz team driver Shane Freiberg, Aaron pulled away and never lost the lead winning by 2 laps in the 45min A-Main. The Buggy A-Main was the last race and what a race it was, the lead changed a few times but in the end we took a brilliant second place to cap off a great weekend. Overall the REDS Engines performed faultlessly for the 3 days in temps as high as 36 degrees Celsius. REDS R5T Team Edition, REDS TS4 Plug, REDS 7mm venturi, REDS Short Header, REDS 2104 pipe, REDS Steel Flywheel (4 shoe), REDS Alloy shoes x 4, low setting on the clutch. REDS R5T Team Edition, REDS TS4 Plug, REDS 7mm venturi, REDS Extra Short Header, REDS 2113 pipe, REDS Alloy Flywheel (4 shoe), REDS Alloy shoes x 4, high setting on the clutch. 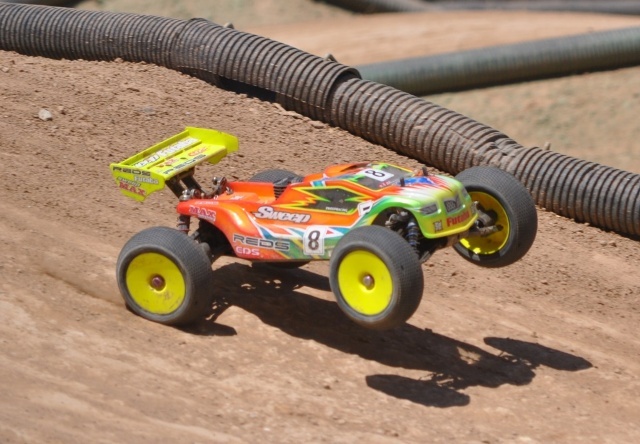 Team Associated have added another vehicle to their Qualifier series of vehicles in the form of the ProSC 4×4 RTR. What would you have for a Radio Control Christmas? I am a dreamer at the best of times, my Christmas wish list is as long as your arm and it isn’t even December yet! But I thought I would see what RC item you would have under your Christmas tree if money was no object. Personally I would have trouble choosing, from Crawlers to Scalers, Drift and Rally cars through to Race Trucks, I think I could name a desirable car in each category just about! So then I thought, well why not write an open letter to Santa! For bashing you have to have something big, powerful and robust. A lot of vehicles fit that description, but for me it has to be electric, so that narrows it a bit. Yes i’m a HPI fanboy so the list has to include the Savage Flux, which is a bashing classic in any guise. The Trophy Truggy Flux also appeals to me for it’s now and fast look, while still clearly being built to take a flogging. The Axial Yeti XL is a big, quick and less common vehicle, and is very tempting. However money no object the clear winner in my book is the biggest of them all, the RTR Baja 5B Flux. Big, Powerful, impressive and fast. Ok, no noise, but the trade off is less annoyed neighbors or beachgoers wherever you are bashing, and no fuel to lug around. An SCX10 is what most of you probably expect to see here, but you would be wrong, I have to say that the Vaterra K5 Blazer Ascender RTR. The body is something a little different, the platform looks strong and flexible, and as always with me, it’s a little different to what everybody else is doing. Until a few weeks ago this would have simply been the Gelande 2 D90 from RC4wd, however RC4wd threw me for a spin recently with the release of the Gelande 2 D110. Let’s face it, the only thing better than a Land Rover Defender, is another Land Rover defender (yes, I suspect I bleed green). I have had a HPI Sprint 2 in the past, and i’d probably go back to one for drifting. I am loving the orange BMW M3 body that comes with the Sprint 2 Flux, so I’d probably say that model with some drift tyres! There are a few more rally platforms out there this Christmas as compared with the last, so there is a lot more choice, but ironically I would go with one that was available last Christmas, the HPI WR8 Flux. Even more so since they released a Subaru Impreza body for the WR8. I preferred the Rally liveries over the Ken Block one (despite being a fan of KB), but they have been discontinued. I hear the Rally purists crying why not a Tamiya XV-01, well I already have one of those! So my racing fleet has seen a serious shakeup this season with the addition of a 2wd Buggy, and the replacement of the SCT with a new one (under construction). 8th and 5th scale I would never get a chance, so a 4wd buggy I think would be the item on the wish list, and whilst I like the Team Durango DEX410V4, I like the design of the HB D413 even better, making it my pick for a new car for racing. With money no object, the Other category is fairly broad, but I think something airborne would be in order, and by something I think I would have to pick the Walkera Scout X4 Quadcopter. With a retractable undercarriage, programmable gps, camera with transmission back to the radio for FPV and a host of fabulous features including a “follow me” mode, it would be a fantastic toy to play with and work with. You can even fit two motors and rotors to each army making it an X8 for heavier loads. With a 25 minute flight time, this is on fantastic piece of equipment which looks fabulous in the grey finish it is available in. Fusion X Engines Australia (check them out at http://www.fusionxengines.com.au/ ) posted some great photos from the event held at Meakin Park over the weekend. Here are a few of them. Check out all the photos on their facebook page here https://www.facebook.com/media/set/?set=a.764799940224202.1073741855.277000175670850&type=1 and make sure you like their facebook page!